You will find many ways on the internet on "how to" take care of this animal. This care sheet is showing the way we found works best for us from our many years of experience of breeding and caring for this species. There is often confusion between the different sub-species of boa constrictor. 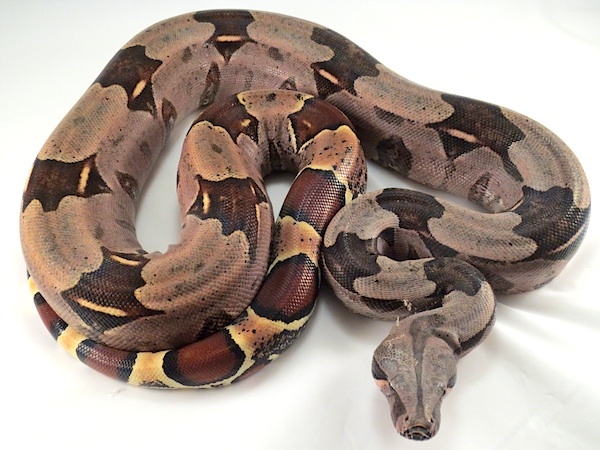 Guyana red-tailed boa constrictors are very popular because of their striking colors. The main differences are: Red-tail Boas are typically heavier bodied than Common Boas. Their markings are quite bold, a light skin tone, bright red-tails with black outlining. Red-tail Boas can be longer than the commons, ranging from eight to ten feet long. True Guyanas are typically not as easy to find as Commons. However, commons can be very nice looking also. If you want a Guyana, be careful when you see a snake for sale labeled as "Red-tail Boa," it could be just a brightly colored Common Boa Constrictor or a cross. There is a lot of cross breeding going on. In the wild, they live on the ground but also in trees. So they will like some height to their enclosure. You can start babies in cages as small as 10 gallons. At around a year old, you can increase the size of the enclosure. There are several kinds that work well for Guyanas, e.g., glass aquariums and any of the commercially available plastic-type reptile cages. For yearlings, step up to an enclosure that is at least 30" x 12" inches (like Zilla critter cage 20 Long) or go bigger like a 36" x 18" (Exo Terra Large, or Zilla 40 gal). If you use a glass tank, you will want to provide a humid hide--that is a hide that has some damp moss in it for extra humidity. A shy boa baby will feel more secure if there is a hide for them on the cool side and the warm side of the enclosure (more about that in the heating section). For an adult boa, you will want a custom enclosure or one of the large 6+ foot molded plastic reptile cages. A 6’ x 3' is a good basic size, though, many people have gone larger and have gotten quite creative with their enclosures. We do not recommend low rack systems for boas as they like to climb and explore. You can use many types of bedding for your Guyana boa. The ones that look the best and help hold some humidity are Zoo Med repti bark, Zilla jungle mix, Zoo Med eco earth, and Zoo Med forest floor. Spot clean the bedding whenever they defecate. You should only need to clean the whole thing out about once a month or so. Disinfect the enclosure and change out the bedding at that time. Zoo Meds wipe out or vinegar and water both work well for cage cleaning. Newspaper is also acceptable, though it doesn’t look as nice and you have to change it all out when they defecate on it. Guyanas originate from a warm climate and so they like it fairly warm. Like all reptiles, they are dependent on external thermoregulation to control their body temperature. This essentially means you need to provide a hot and a cool side to your enclosure. All the heat elements should be on one side and the other will then be the cool side. This way, your boa can move back and forth between the different temperatures depending on its needs. The hot side basking spot should be at 88-90 degrees. Put one hide there and another the cooler side. The cool side can be between 80-85 degrees. Night drops in temperature are not recommended. It's a good idea to use a basking light and an under tank heat pad also. The heat pads are usually placed on the hot side with a hide over it. We recommend a Zoo Med heat mat or Exo Terra heat pad which stays on 24/7 to give them a little bit of supplemental heat during the night. Both of these are placed on the outside, underneath the enclosure. You want a heat pad that only covers half the tank (or less). The basking light should be housed in a good quality light dome like Exo Terra and Flukers that has a ceramic housing to tolerate high heat and an on/off switch. Use a good quality temperature gauge too, like Zoo Meds digital temp gauge or Exo Terras Thermometer. Don't guess at it. You can also use a rheostat and/or timers to control your heat source. We do not recommend the use of hot rocks. They have a tendency to heat unevenly over too small an area and can cause serious burns. Keep a non-porous water bowl in with your Guyana boa, and make sure it always have clean water. Exo Terras water bowls or Flukers water bowls are good decorative choices or a good ceramic crock dish. Scrub the bowl at least once a week to keep bacteria slime from building up. If you maintain a humidity level of 60-70%, your boa will be able to shed properly. Hand misters are usually sufficient but if you don't care to remember to mist, an automatic mister like the Exo Terra monsoon or the Zoo Med fogger are nice options. Do not handle your Guyana red-tailed boa for several hours before feeding it. You can feed it in its own enclosure or move it to a designated "feeding" tub. The choice is yours. Most Guyanas don’t mind being moved before they eat. They are generally very docile snakes, although they do have a good feeding response. If you are worried about your pet thinking you are going to feed it every time you handle it, then get yourself a good snake hook. Just hook your snake out of its enclosure when you want to hold him. Check out these hooks: collapsible hook for babies and larger hooks for adults. Using a snake hook when you take your boa out will greatly reduce the chance of you being bit from a feeding response. If you don't have a hook and are still worried about picking up your snake, don't come at it from the front. Reach around and pick your snake up from behind. That way your hand is not coming at its face. 1 rodent of appropriate size once a week. This means the girth of the rodent should not exceed the girth of the snake (at it's biggest point, not his neck size) Some people say you can give them rodents 1 1/2 times as big as the girth of the snake. However, boas have a slow metabolism and we have found that they eat better and tend not to skip meals if you don't exceed its girth. Do not handle your snake for at least 24 hours after it has eaten. You can cut back to 1 rodent every 2 weeks if you want. If you do this make sure it is a decent size meal, don't skimp. Continue on the once a week regime with a slightly smaller meal than if you are feeding every two weeks. Snakes in general tend not to eat when they are in shed. Just wait to feed until it has shed. Babies Guyanas usually will eat through the winter as long as they are warm enough. However, some adults may “go off food” during this time. This is a natural time for them to breed, and so not eat as much. Just keep an eye on your snake's overall condition and body weight. Typically, with a healthy boa, this is nothing to worry about. Offer your pet food every 2 weeks or so until it starts eating again. Guyanas have the potential for becoming quite large. So these snakes are best suited for people who've had some experience keeping similar large animals in the past. When holding your pet, always remember to support your snakes body. Guyanas like to explore but will usually settle down on you after a few minutes. Give your pet some time to get used to you. Avoid touching the top of your new snake's head. Unless it knows and trusts you, touching the top of the head will cause it to jerk back away. The fast movement is called being "head shy" and tends to scare a lot of new snake owners. Most will get over it with gentle handling. Give your Guyana boa at least a couple days to settle in to its new home before handling. Start slow and gradually increase the amount of time you have your snake out. Remember, your new pet's life is in your hands. So please take care of them properly.